When you’re wanting to hear something to “put you in the spirit” this season, give this a listen. Originally done to entertain a studio audience last year (which succeeded in delivering background laughter & applause you’ll hear), this audio-only rendition spell-bindingly captures the emotion that makes this such a time-honored tale. 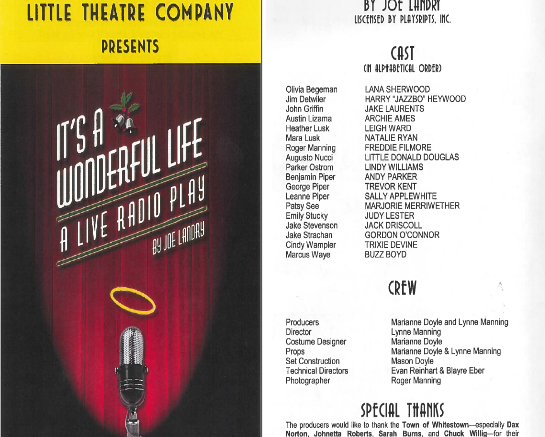 My role is that of the fictitious actor Jake Laurents playing George Bailey. A handful of actors performed all roles live while standing in front of microphones, scripts in hand. Accompanying us were child & teen operators of a sound effects “foley” table. 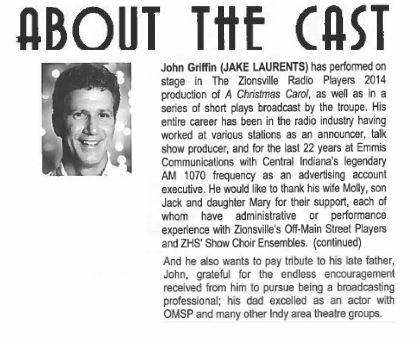 Commercial breaks written in to the script have actors reading or singing advertising jingles as would’ve been done in this era of broadcasting. The intermission with 1940s nostalgia music is 15 minutes long. So enjoy listening while wrapping presents, putting up decorations, relaxing in your home, road tripping to see family & friends, or even simply commuting.